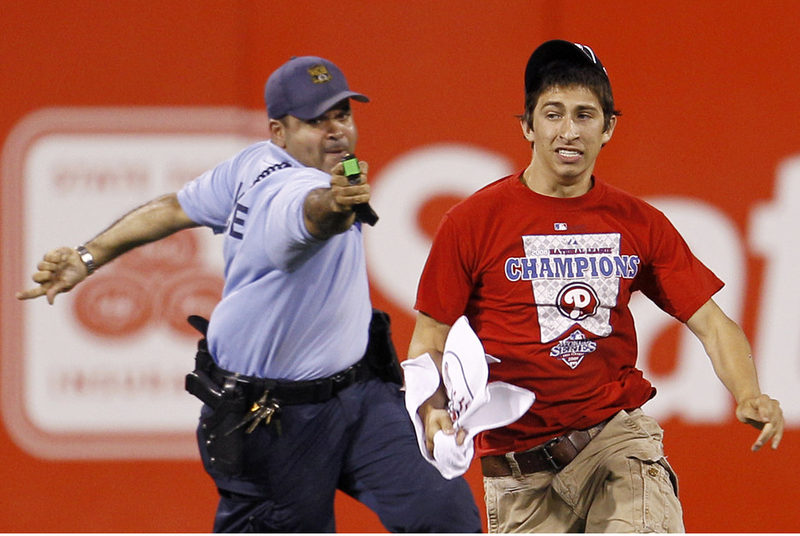 At first blush, the scene is actually kind of funny, almost like something of out a Keystone Cops movie: Six security guards chasing a young man in a Philadelphia Phillies t-shirt around the outfield of Citizen’s Bank Park, incapable of corralling him. And then it happens. A slightly overweight police officer (above) aims his taser and brings him down in a flash, the young man’s arms contorted, his body thoroughly incapacitated. The fans, who were apparently chanting “Tase him, tase him!” were delighted. Players shook their heads with a bemused look that seemed to say, “what an idiot.” The body was removed and the game went on. The event, captured on U-tube, went viral and became the subject of jokes by everyone from Jay Leno to Charles Barkley to the local reporters on Fox News. Fans running onto the field at sporting events is really nothing new. Indeed, it has become something of a ritual in a culture that continues to honor fifteen minutes (or even forty-five seconds) of celebrity and fame. These diversions are an inconvenience for those assigned to maintain order at such public gatherings and, perhaps, more so for the broadcast networks who are caught between the desire to present the sideshow to their viewers—who, after all, really want to see it—and to avoid encouraging such transgressions. The question, however, has to be, does such an inconvenience warrant the use of 50,000 volts of electricity to maintain law and order? In the City of Brotherly Love the answer appears to be yes, as the caption to the above photograph reports that the Police Commissioner concluded that “the officer acted within department guidelines, which allows officers to use tasers to arrest fleeing suspects.” But even a quick search on google makes it clear that the use of tasers hss become a regular part of a growing police state, employed not only to detain violent criminals, but also to force compliance from individuals asking unwelcome questions at political rallies and, in one instance, a 72 year old great grandmother who refused to sign her speeding ticket. Clearly, the police need to be able to protect both the public and themselves against dangerous criminals, and just as clearly, non-lethal weapons are generally to be preferred to more lethal alternatives (although we need to be mindful of the fact that the characterization of the taser as “non-lethal” might be something of an overstatement). But as this photograph shows, the standards for affecting such “protection” have been normalized in disturbingly Orwellian terms. The young man doesn’t seem to be a threat to anyone, a point made all the more clear in the U-tube video of the spectacle. And to identify him as a “suspect” certainly stretches the meaning of that term to the outer limits of use or recognition. A more accurate term to characterize him might be “scofflaw,” but then that would hardly warrant the brutal usage of what the police now euphemistically refer to as “pain compliance.” Tasers, make not mistake, are weapons of torture, emitting as much as 120,000 volts of electricity in the name of achieving “compliance.” And what we are witnessing here is the gradual descent into a world in which “law and order” is routinized as a culture of “zero tolerance” for any and all discretions. It really ought to give us pause. Good point – in the case of the “slightly overweight” officer in the picture, I’d say that it was easier for him to tase the guy rather than to run a bit faster and wrestle him to the ground. Sign of the (fat) times I guess..
It’s a great picture though! Why tase someone who trespasses on the field of play? How about William Ligue Jr.? He and his son attacked baseball coach Tom Gamboa during a game? How about Günter Parche? For those with short memories, he stabbed tennis player Monica Selles during a match. I see no problem with tasing them. This was a physically full grown male, not a a kid or some elderly person. Use of any force has to be weighed first, on a case by case basis. As for this one, I agree with the officer’s use of this level of force. Wiredog: The two situations you mention are both aberrations. And there is NO evidence that would suggest that if security had access to tasers in those situations that the outcome would be any different than it was. But those examples are red herrings that divert attention from the larger point: The guy in this photo was not a threat to anyone, certainly not the five security agents being made to look rather foolish trying (and failing) to corral him. The taser here was wholly excessive and unnecessary — and wholly punitive.